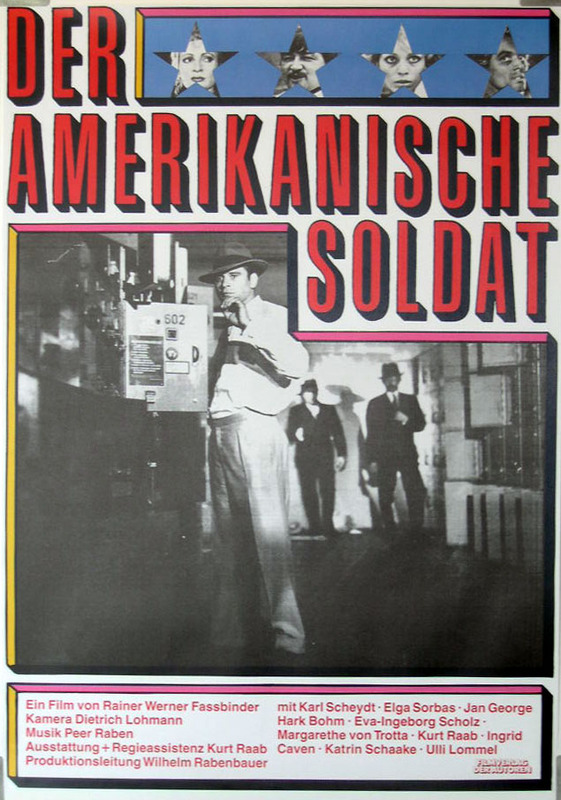 Originally planned as featuring the director’s then (and thoroughly heterosexual) lover Günther Kaufmann (Rio das Mortes, Whity) and to be shot on CinemaScope in Berlin, The American Soldier (1970) aka Der amerikanische Soldat was ultimately postponed due to auteur Rainer Werner Fassbinder’s bitter and failed love affair with the film’s heterosexual black Bavarian star and would inevitably deevolve. Instead, Fassbinder decided to fly to Paris to enjoy the city of love’s sodomite saunas. 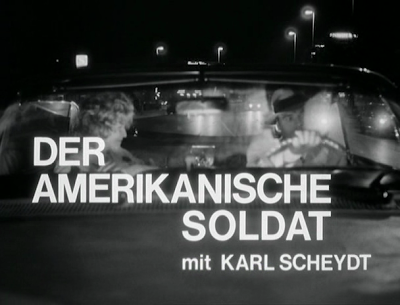 When The American Soldier went into production, it did not feature Herr Kaufmann and was shot with a low-budget using black-and-white film stock, thus making the film have similar aesthetic qualities to the director’s two previous kraut gangster flicks, Love is Colder than Death (1969) aka Liebe ist kälter als der Tod and Gods of the Plague (1970) aka Götter der Pest. All three films would make up a kraut-fried yet Hollywood inspired gangster film trilogy, with the final chapter, The American Soldier, being arguably the most cinematically reflexive and purposely postmodern yet ultimately incoherent and avant-garde-addled. With a misleading title that is more representative of Fassbinder’s Americanized love for Hollywood cinema than a true description of the film’s hero, The American Soldier follows a German-born man who “flew over the great pond” to America and fought as an honorary Yank in the Vietnam war to battle the same Bolshevik plague his Teutonic brothers fought in the Second World War, only to come back to his hometown of Munich to work as a cold-blooded contract killer for a trio of corrupt gangster-movie-worshiping cops who have a naughty knack for gambling with pornographic playing cards and petty criminals' lives. Referencing to grand queen auteur filmmakers of German cinema history, F.W. 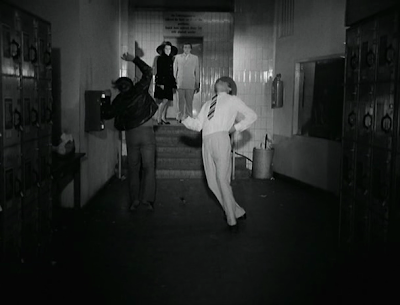 Murnau and Rosa von Praunheim, the latter of which who would incidentally become an arch nemesis of Fassbinder (von Praunheim even once admitted he was relieved when he died), The American Soldier is less an homage to American gangster flicks than a film that deconstructs such works, while also criticizing the corrosive cultural hegemony of America/Hollywood on not just Germany, but also the entire world, hence why the film’s protagonist, a Vietnam vet, ultimately did dirty work for the USA and has now come back to his homeland to wreak havoc and kill a couple fellow krauts along the way. 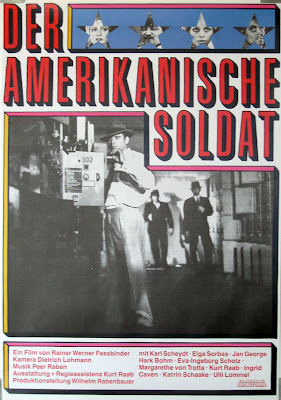 By no means a a cinematically immaculate masterpiece, The American Soldier is essentially a curious piece of experimental kraut crime cinema directed by a man that was destined for greater and less masturbatory things who was practically raised on Hollywood films, but would become what was indisputably post-WWII Germany’s most important and prolific filmmaker and who ultimately made his celluloid works palatable to both the proletariat and the bourgeoisie, something his quasi-commie compatriots like Alexander Kluge and Jean-Marie Straub could never do as pedantic guards of the German of the far-left Ivory Tower. Of course, The American Soldier seems like it was specially tailored for left-leaning film critics and those that would love nothing more than to see the gangster flick aesthetically and thematically defiled, but it is still pure Fassbinder, even not as cultivated and more audience antagonistic. Ricky (Karl Scheydt) alias Richard Murphy alias Richard Von Rezzori, who describes his lifetime story to a whore as follows, “It all began in Germany...Once upon a time, there was a little boy...He flew over the great pond...Damn it,” is the man with the plan, otherwise known as contract killing, but the problem is that a single snitch can get him killed and killing fellow criminals for cops comes with its own number of liabilities. A seemingly stoic veteran of the Vietnam War, which he simply describes as being “loud,” Ricky is more than ready to show off his imported skills as an American-manufactured killing machine. A fellow with a sadistic streak, Ricky almost scares to death a slutty chick (Irm Hermann who is credited as “hure” aka “whore”) by kicking her out of his car and shooting her full of blanks. Not someone to forget an old friend, Ricky hooks up with his old comrade Franz Walsch (Fassbinder reprised his role from Lover is Colder than Death) or as he states while trying to get a hold of him over the phone, “W for “war,” A for “Alamo,” L for “Lenin,” S for “science fiction,” C for “crime,” H for “hell.” Ricky and Franz go for a scenic and soothing ride and the reluctant American sentimentally states to his comrade, “Nothing ever happens in Germany…I’m rather fond of old Germany, all the same.” Indeed, the two boorish Bavarian buds seem to have more than enough fun drinking cheap beer and littering with the empty cans. 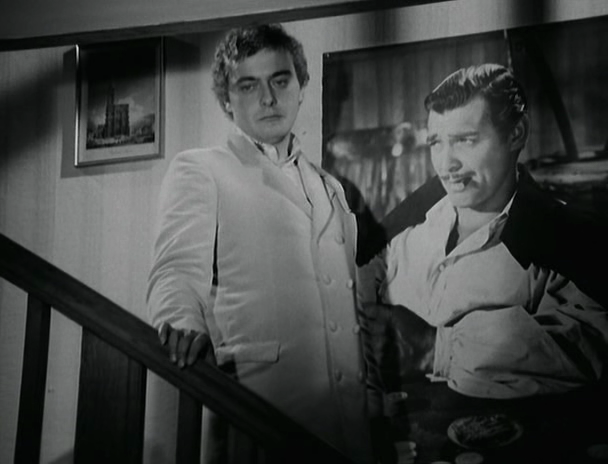 After going to his mother (Eva Ingeborg Scholz) and Clark Gable-loving gay brother (Kurt Raab) in what turns out to be a rather uneventful family get together involving pinball and foreboding emotional coldness, Franz gets what he came back to Munich for, killing people that apparently need to be killed. The first person that is gunned down is a gay palm-reading gypsy named Tony (played by Ulli Lommel in what is very possibly his most unflattering role ever), which proves to be a rather lackluster, if not lethal, task for Ricky. Seemingly nonsensical things happen around Ricky, including the strange behavior of a maid (Margarethe von Trotta), who after describing supposed German racism against Turks that are called “Ali” (this discussion would inevitably evolve into Fassbinder’s Sirkian masterpiece Ali: Fear Eats the Soul (1974)) and crying about her lover Pierre, stabs herself in the stomach with a butcher knife samurai-style while hanging over a stairwell railing. Of course, Ricky has bigger things to worry about than paying mind to a seeming horribly hysterical and melancholy maniac of a maid because he has fallen in love with one of his contract killing targets, Rosa von Praunheim (Elga Sorbas), the girlfriend of one of the pernicious police who hired him to do their dirty work. Of course, since they hired him to commit highly illegal and innately incriminating acts, the police also decide to dispose of Ricky, but unfortunately Franz gets in the middle of it, thus resulting in the deaths of two best friend who would have been better off dead during the Second World War, at least if one were to judge by their romantic longings for a nation that, at least in spirit, no longer exists. Trading in the pioneering celluloid poems of Teutonic master auteur F.W. Murnau (Nosferatu: A Symphony of Horror, The Last Laugh aka Der letzte Mann) for a uniquely unhealthy and culturally vapid diet of cheap carboncopy cinematic products otherwise known as Hollywood gangster films, Germany lost more than just a good percentage of its population, as well as its international reputation as a result of the Second World War and The American Soldier, like much of Fassbinder’s oeuvre, is certainly a scathing symptom of that. Featuring cops who think they are gangsters after watching one too many American film noir flicks and a culturally confused protagonist who clearly loves his birth nation more than his adopted one yet seems tragically deracinated from it for whatever reason, The American Soldier is the sad, if not oftentimes sardonic, tale of a nation with a decidedly dead soul, where everyone can be bought, sold, and/or killed for the right price, which is undoubtedly an American tradition. The fact that the protagonist of the film, Ricky, who is admittedly “rather fond of old Germany,” is an ostensible aristocrat who consciously made the decision to degrade himself by becoming a peasant soldier in a nation populated by Europe’s rejects in a war battling communism—the very thing the German National Socialists sought to destroy on the Eastern Front—only goes to show how far Germany had fallen. Tastelessly enough, director Rainer Werner Fassbinder would marry star Ingrid Caven during a lunch break in between shooting for The American Soldier and the director can even be seen wearing the same white suit he wore during the wedding in the film. Incidentally, Günther Kaufmann, who Fassbinder fired from starring in The American Soldier for not reciprocating his love to the director, would act as the filmmaker’s best man at the wedding. While not starring in The American Soldier, Kaufmann would provide his Jim Morrison-like vocals to the film’s theme song “So Much Tenderness,” with the lyrics being written by Fassbinder himself and the music by Peer Raben. Fassbinder’s wife Ingrid Caven, who would divorce the filmmaker in two years and inevitably become the cinematic diva of Daniel Schmid (Tonight or Never, La Paloma) sings and performs a song she wrote entitled, “With My Tears,” towards the beginning of The American Soldier. The ultimately bastardized and partially aborted yet still spawned product of a project initially intended to be realized as a romantic present for a black buck Bavarian, The American Soldier practically stews in a certain pessimistic melancholy that is surely colder than death, but also relies on the pseudo-masculine Hollywood cinematic conventions promoted to profit off of the poor proletarian looking to learn how to posture themselves as imaginary American bad asses. As American as imported sauerkraut, The American Soldier is the aesthetically wacky result of what happens when a cultureless consumer consumes a real culture and is vomited out by said real culture.